The four developments, which are yet to be finished, are scattered across Dublin. A €425 MILLION-PLUS price tag has been placed on Ireland’s largest-ever portfolio of private rental properties, which are in the process of being built across several different Dublin sites. The sale from Marlet Property Group includes residential schemes that, when completed, will house nearly 1,200 apartments. The company, a joint venture between M&G Investments and local developer Pat Crean, has appointed agents Savills to put the properties on the market this week. In a briefing note to clients this morning, Goodbody analyst Colm Lauder said if the properties were sold as one package for the proposed price of €425 million or more it would “represent the largest single residential investment transaction in Ireland”. The portfolio – dubbed ‘Dublin Living’ – covers three locations in the Irish capital. 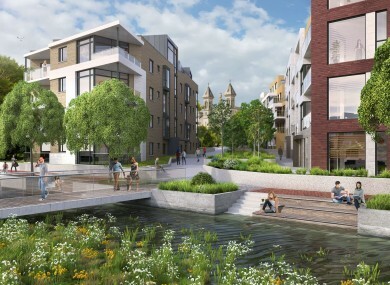 Work is due to start on three of the developments – St Clare’s in Harold’s Cross, Carriglea in Bluebell and at Cabra Road – in the coming weeks, with all due to be finished by the start of 2020. Mount Argus, also at Harold’s Cross, is due to be finished by mid-next year. The agents estimate that the rent for the entire property portfolio will be more than €20 million each year. Lauder said that because new developments aren’t subject to rent controls when first put on the market, the package would represent “a highly competitive” investment for an eventual buyer. “Assuming modest rental growth (4% cap per annum), this yield could rise to 5.5% by the time the developments are completed. We see a scenario where the yield could hit 6% on completion handover. The development of a portfolio of schemes, such as proposed by Marlet, will finally provide scale in the private rental investment sector in Ireland. It may also provide opportunities for new or existing investors, like Ires (Reit), to dramatically grow their Irish footprint. On completion, the four developments will contain a total of 1,170 units – most of which will be two-bed apartments. Some 255 of the apartments will only have one bed, with the remaining 165 units to be three-bed apartments. The buildings will also contain lounges for residents, business centres, meeting rooms, concierge facilities and gyms. The most recent rental report from property site Daft.ie highlighted a 13.4% increase in average rents nationwide. The largest increase was seen in Dublin, with prices up 13.9% during the year to an average of €1,668. Rents in the capital are now 15.4% above their Celtic Tiger peak of early 2008, before the property bubble’s dramatic deflation. Ires, Ireland’s largest private landlord, recently set a new ‘benchmark’ for Dublin rents with its new Maple complex in Sandyford. The apartments are listed as available from July with prices starting at €1,925 per month for one-bedroom properties and rising to €2,750 for three-bedroom units. Note: Fora publisher Journal Media Ltd has some shareholders in common with Daft.ie. Email “Ireland's largest-ever portfolio of rental properties is on sale for €425m-plus”. Feedback on “Ireland's largest-ever portfolio of rental properties is on sale for €425m-plus”.